Internet is a real storehouse of knowledge! Using the web space, you can easily access any source of useful information required for self-education. A great variety of tutorials, classes, web magazines, online newspapers, e-learning materials, books, blogs, newsletters, audio and video materials, and many other issues are available for those who wish to improve their skills as well as master new knowledge. 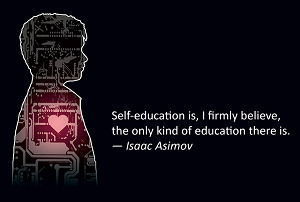 Most of the web resources for self-education are free of charge, while some of them charge a fee that is absolutely worth it. We have selected five useful resources that may help you to manage the process of self-education and ease your learning investigations. HowStuffWorks does not look like the typical academic database you used to see. However, if you are on the lookout for reliable and practical information on how various things work, you will definitely enjoy surfing the www.howstuffworks.com! The web site includes both – theory as well as practical information regarding a wide range of topics including food, health care, geography, computers and many more. As for The Personal MBA, this web site is nowadays one of the most popular among the resources for the self-education since it is narrowly focused. Although the title of the www.personalmba.com is primarily linked with business, the source also provides a great example of how to manage the process of learning in this or that specific subject area. Surfing the Questia you will get a round-the-clock access to the largest online collection of journal articles and books available on the globe. Besides, the site www.questia.com includes newspaper articles, magazines, as well as scholarly content chosen by experienced collection development librarians that one cannot find anywhere else on the web. In addition, the Questa provides a wide range of note-taking, search and writing tools that help users quickly locate the most useful information on the required topics as well as cite it correctly. Would you like to study for free? Self Made Scholar resource at http://selfmadescholar.com provides you with a chance to link to the other users as well as the resources that you may be in need of. Any person, who is interested in self-education is welcome to become the member of the community! College and university students, stay-at-home mothers, seniors – everyone can make use of this resource! Open Culture provides a great variety of links to the best educational and cultural media available on the internet. The editor of the Open Culture web site makes sure to scour the internet for what he believes to be the best educational and cultural media. Then, he presents all sorts of information via http://www.openculture.com/ in an exceptionally neat manner. Without a doubt, internet has become the number one resource of knowledge for many people all over the globe. One can easily lose him- or herself in this storehouse of knowledge gathered in an open source style. However, the sources mentioned above will help you to stay on track and find the required information quickly.